Want To Chat About This? We provide a trusted edition printing service, that is used by various artists who print anywhere from one to many thousands of limited edition prints a year. Colour management has always been the core of our work, allowing us to be printing consistent edition runs for artists 10 years after the initial print. We work with you to reduce the time and expense involved in producing edition print runs and can safely store your files for when you require them, eliminating the risk of lost, corrupt files and ensuring you receive perfect reproductions every time. Talk to us about your printing ambitions with a one on one consultation. We get started on creating your digital file (if required) and printing a proof on your choice of media ready for your approval. We create beautiful fine art archival prints, printed with state of the art colour management using Epson printers and inks. 3. Leave it to us! Once you are happy, we get printing! We can safely store your approved file in our client library at no cost allowing you to print it as required. Your edition prints are ready for signing, embossing and sending out. We can store your digital files in our library so you can order your prints as you need them. Simply let us know the file name and size and we will print it for you without you sending us your file each time. Each image will be a perfect reproduction of the last. You will need to either bring in or send through your high quality digital files and indicate that you would like them to be added to our Client Library and we copy them to our storage system. This system is fault tolerant (i.e. highly reliable) and if nothing else this means you have a high quality digital backup of your files in a separate geographic location (of course you should keep your own originals as well, ideally burned to archival media). There is no cost for this. How many prints should I have in my edition run? There is no hard fast rule to this - there are many possibilities from one to however many thousand you like! The most important thing is to be clear and consistent about what you are offering - don't change the edition limit after you have started selling them. Do I have to print all my edition at once? You don't have to print all of your edition run at once - you can print them in small lots, or even just singles if you like. 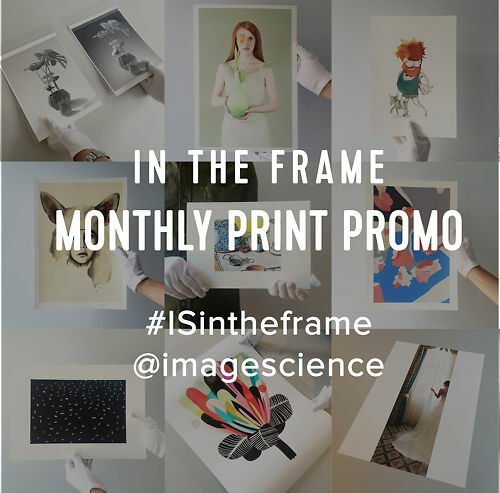 This can save you money so you're not paying for all prints upfront and just as they sell. How do I create a digital file of my original artwork? We offer an art reproduction service which includes scanning your original artwork and retouching to create a print ready, digital file. More information about this service here. Can I have my edition prints sent directly to my customers? 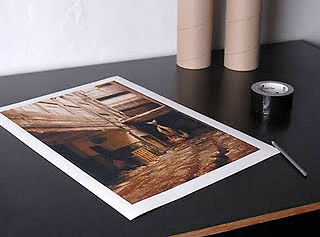 We can send prints directly to your customers. Just add their details into the shipping address in the cart and make a note to send directly to your customer. Can I come in to sign my prints after they have been printed? We have a set of plan drawers that we can keep your prints in for you to come and sign once printed. They can only fit prints up to 24 by 30 Inches, so anything bigger we are unable to accommodate. 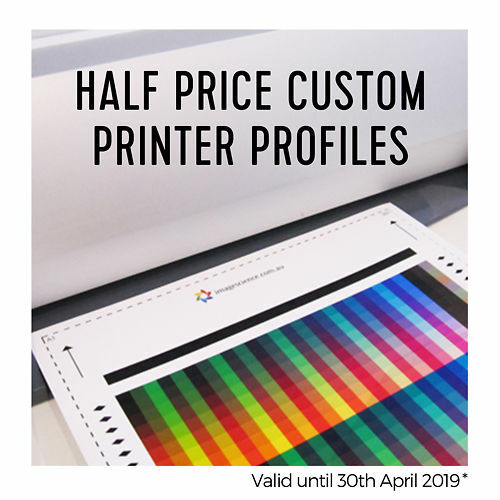 We are only able to hold prints for signing for up to one week after they have been completed as there is only a limited amount of space available. 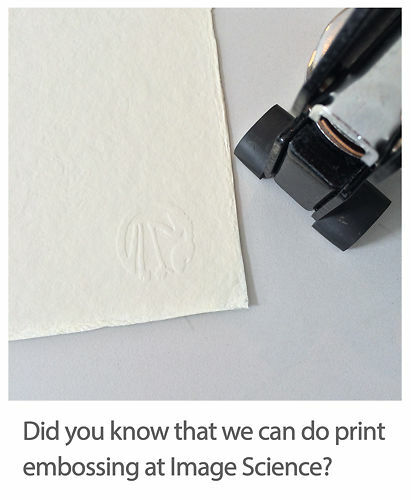 Do you offer a print embossing service? We are able to emboss your prints with either a personal chop mark or the Image Science mark. We can also facilitate the production of your own embossing plate for use with our press here. The fee to have a set of plates made is approximately $550. They are designed for marking 300gsm fine art paper, but work well with paper 200gsm and up, and with other materials like canvas as well. They are circular with a diameter of 48mm. To have your own embossing seal made, you will need to supply appropriate artwork in black and white TIF format.